This is my quote, but I've also heard it from Pamela, Loribeth, Lisa, Klara, and all the other No Kidding bloggers and No Kidding internet friends I've ever talked to online. Maybe not at first, but after a year, or two. Lisa's most recent post, announcing that her life is pretty perfect, is a classic example of this. It may take us a while to get there. But the one thing I can say after observing this for almost 14 years is that we all get there in the end. Great message, Mali. I'm starting to see glimpses of hope again. I'm starting to genuinely like my life again (most of the time). Wishing you an abundance of hopeful days. 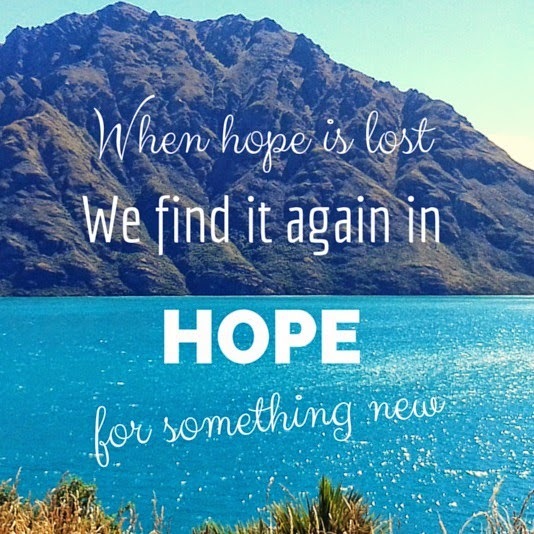 Love this quote -- helps to keep the sting out of the word "hope" when it hasn't exactly been your friend previously. I love the idea of hoping for something new! It's an uplifting message and certainly gives hope to those of us just starting to realise that it may not be possible for us to have that family we wanted. Thank you. Good quote. A friend once sent me a card that started, "Dream a new dream..." I've often thought about that card, which I still have, when life shares its disappointments and you are ready to move forward. I'm glad you shared this because ever since IF, I've had a not-healthy relationship with Hope. This is a good reframing. I agree we all get there at the end. Hoping, we never cease to. A great quote to begin my day today. Just found out today most of my team (including myself) are losing our jobs today. It's nothing compared to going through infertility. I'm hoping this unrequested path, will lead to another, better possibility, so this post is very timely. I hope you find that this unrequested path opens up a wealth of new opportunities. Glad my post might have helped. The resilience of humans is astounding as is our ability to find happiness over time.